Odds are exceedingly good that February will top January’s contribution to precipitation in California. It’s hard to be drier than what was essentially zero rain and snowfall last month. The state’s driest January on record dropped the Northern Sierra Precipitation Index down from 145 percent of average at the end of stormy December to 84 percent of average today, Feb. 4. And this is for California’s wettest region, the Sacramento Valley. For the San Joaquin Valley and Tulare basin (where most water use occurs), precipitation is, respectively, 43 percent and 45 percent of average for this date. What does this mean for the usually wet months of February and March? Statistically, not much can be said. 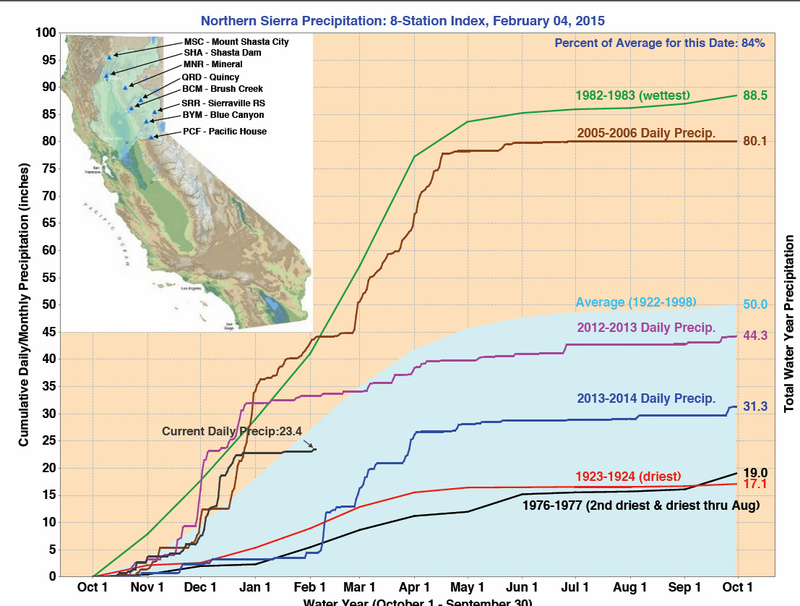 There is little correlation in monthly precipitation during Northern California’s wet season. But droughts by nature are exceptional, so we should prepare for yet a fourth straight year of exceptionally dry conditions. Despite December’s storms, California’s drought remains very much alive. 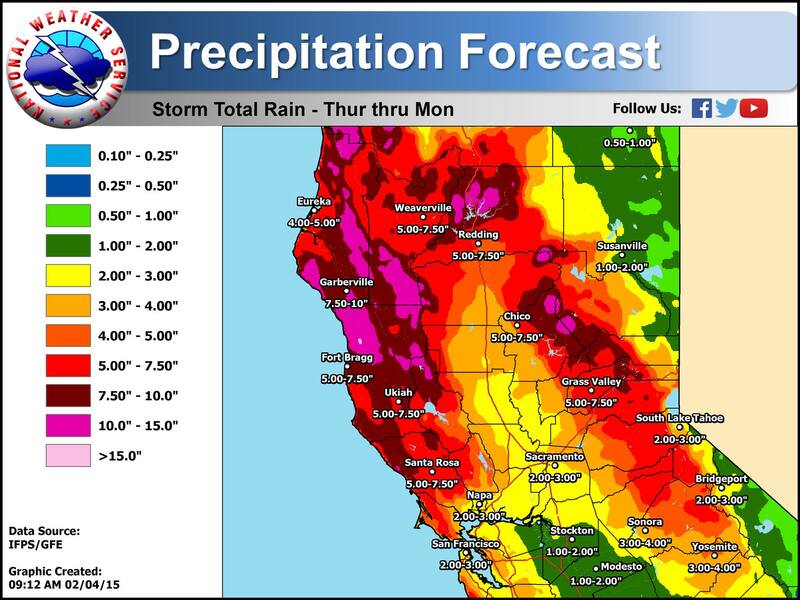 The heavy rain forecast for Northern California this weekend won’t wash it away. We are halfway through the wet season and our reservoirs overall are holding little more than they did a year ago. Our aquifers are holding less. The snowpack is 25 percent of average and precipitation statewide is well below average for this time of year. Native fish are worse off in many areas. A drought worse than last year’s whopper is unlikely but remains a possibility, especially for the southern Central Valley. We still can’t say much for sure about the 2015 water outlook until March. But with only two months left in the wet season, continued drought seems likely. Fortunately, many Northern California reservoirs have more storage than they did a year ago, while reservoir levels elsewhere are more mixed. 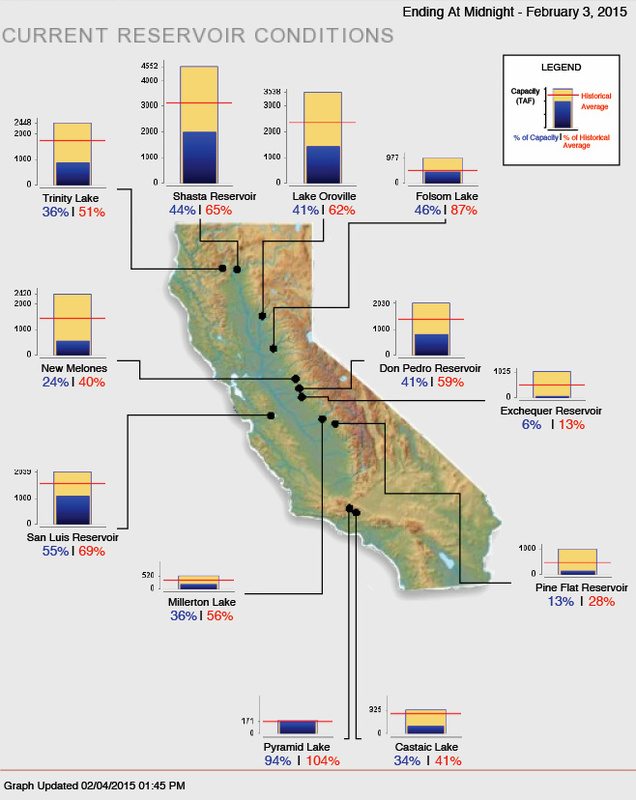 Overall, we remain about 6 million acre-feet below average for reservoir storage this time of year. Aquifer levels are slowly rising but still probably much lower than they were a year ago in the areas highly dependent on groundwater. Snowpack is sparse throughout the Sierra Nevada, about 25% of average for this time of year. 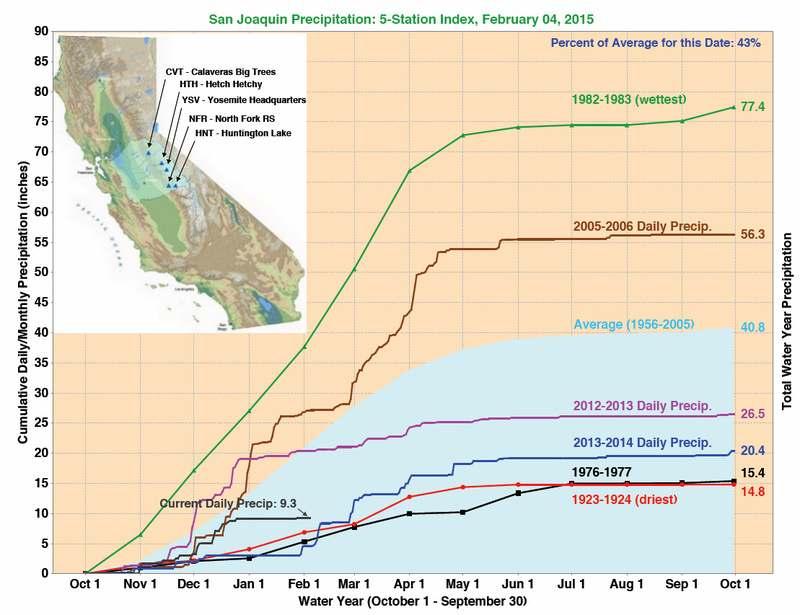 Last year ended at 60 percent of average annual precipitation for Sacramento Valley. For 2015, we’re already at about 50 percent, thanks to a wet December. It seems unlikely this year will be drier than last, but it could happen if February and March are a bust. 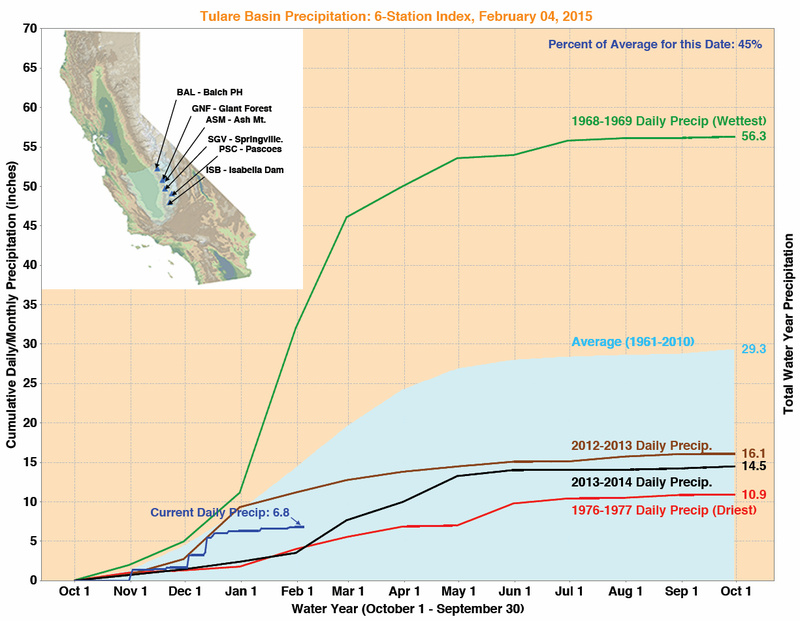 So far, both the San Joaquin Valley and Tulare basin are wetter than this time last year, but not by much. Remember, the difference between a drought and a wet year in California is just a few storms. We still have months to go. The links above can help keep you up to date. For more data, you might enjoy poking around the California Department of Water CDEC web site http://cdec.water.ca.gov. Some statistical views of drought and El Nino in California can be found in the further readings below. Under proper management Folsom Lake will be at 100% of historical average after the projected storm if it lives up to projections. However please be advised that the federal government is at those controls and a great deal of the much needed water will likely be wasted at outrageous levels during the darkness of night in order to maintain a state of emergency solely for political purposes. Full reservoirs are not wanted by this administration. They want a sense of urgency to further their chances at increased taxes and to create a higher level of acceptance for environmental damage that they intend to impose. Reblogged this on Rainscape Designs.